My Unforgettable Seventeenth Summer! By: Maria I. Do you ever stop and wonder if you actually love someone or if it's just infatuation? Loving someone means doing anything for them and deeply caring for them, while infatuation is just being carried away with someone because of their looks. Angie Morrow is a 17 year old girl in high school and she always thought of high school romances as silly infatuations that come and go, until she met Jack Duluth at McKnight's drugstore. Angie and Jack bump into each other at the drugstore while Angie is running an errand for her dad and Jack was there for the same reason; ever since then Jack kept trying to make Angie fall for him. Angie and Jack go out on a date and very soon Angie realizes that she is falling head over heels in love for Jack, and Jack realizes that he is also falling in love with her. They spend time together and fill their summer nights with stolen moments and romantic nights, although Angie is constantly thinking about what will happen in the fall when they both go to college. With fall growing closer and closer everyday, Angie and Jack must figure out if their love will be forever and always or just one special summer that they will never forget! 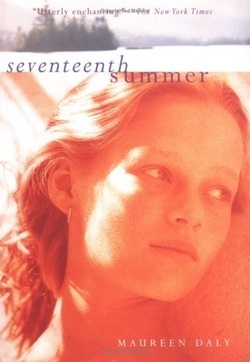 After reading Seventeenth Summer I had some pretty powerful emotions, and one thing I should I say that it is definitely your summer romance. In this book, there will be laughs, love, family, friendship, and most of all decisions, decisions, and more decisions. Maureen Daly, the author of Seventeenth Summer, really brought out the best in Angie Marrow's character: a girl who is shy, listens to her parents, is very nice, and thinks of high school romance as pathetic. While Jack on the other hand wants to have a summer romance and to be with someone. That someone would be Angie. Of course, the story had it's flaws. I mean what's a romance without some tension, jealousy, and most of all confusion and heartbreak. Personally, I really enjoyed reading this book and it taught me a lot of things and if you want to know what, you'll just have to go to the library and check the book out! I would give Seventeenth Summer 5 stars because if your looking for a summer romance unlike any other than this is definitely a book that you should read! Be Careful What You Wish For! By: Maria I. How far would you go to be beautiful? Have you ever wanted something so bad in your life, that you would give anything and do anything to have it. 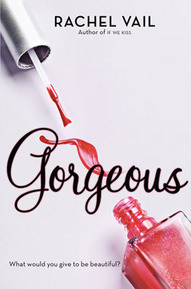 In the book Gorgeous by Rachel Vail, Allison Avery has always been the “interesting looking" Avery. Growing up with her gorgeously beautiful blonde sisters, she was the one with the dark hair. Allison would give anything to be gorgeous, and she gets her chance when the devil shows up to grant her wish. Allison gets a chance from the devil to be gorgeous, although there is one catch and it's not her soul that the devil wants. It's her cellphone... Things start to go downhill and so does Allison's life. How far will Allison go to be gorgeous for all eternity? After reading Rachel Vail's book Gorgeous I particularly liked some parts of it and didn't like others. There were a few things that I absolutely loved and sometimes things got so intense that I had to put the book down. One of my favorite parts is when the devil grants Allison's wish by making her gorgeous. Then, when she wakes up the next morning she isn't sure if she dreamed of this until she looks in the mirror. Allison just doesn't believe that this is really her! I found this part entertaining to read. However, a part that I didn't really like was how the devil possessed her phone. Since the devil had her cellphone he was able to do whatever he wanted with it. The devil started sending cruel texts and calling people to leave very mean messages. The victims were who Allison cared for and loved. I didn't like this part because I felt the devil went a little bit overboard with having Allison's cellphone. If I was asked to give this book a rating I would give it 5 out of 5 stars. Even though some parts were intense, this novel goes to show that you should Be Careful What You Wish For because it may not be what you would have wanted in the end! Palacio's Wonder by Maria I. "Whatever your thinking, it's probably worse." ~ August Pullman's quote in the beginning of the book. You might think going through middle school is horrifying, right? Well, imagine going through middle school with a facial deformity. August (Auggie) Pullman has been home schooled his whole life until now. Auggie our main character in Wonder, R.J. Palacio's first novel was born with a facial deformity that prevented him from going to mainsream school. That is until now, August is going to be entering fifth grade at Beecher Prep Middle School. Now, some of us have been the new kid, right? Well if you were you probably know how August is feeling. Although, Auggie is just your natural ordinary kid who loves Star Wars and has a dog named Daisy, but his face is extraordinary. August Pullman wants nothing more than to be treated like your average fifth grade kid, but will his new classmates be able to get passed Auggie's very interesting face? My opinion of the book Wonder by: R.J. Palacio is that this book was one of the greatest novels I have ever read. This novel is unlike any other novel I have read, because it dosen't describe the main character very literally. My favorite part of the novel is when Jack stands up for Auggie at the nature reserve; I thought that was very noble of him. Despite Auggie's facial apperance Jack still stood up for him because he thought of August as a friend. I would give this novel a 5 out of 5 stars. This is because I think that this novel is very decent to read, because it tells you to "Not judge a boy by his face!" ~ Quote by August Pullman on the back of the book.